Television viewers in Wales have made history by becoming the first in the UK to lose their analogue signal. 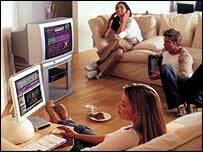 Around 450 households in Ferryside and Llanstephan are able to receive digital TV only from Wednesday. Residents of the Carmarthenshire villages - on either side of the River Tywi - voted to switch to digital-only after taking part in a pilot scheme. The old analogue network is due to disappear across Wales by 2008 - ahead of a planned UK changeover in 2012. Just one channel, BBC2 Wales, will still run on the analogue network. The west Wales households agreed to try digital set-top boxes when digital transmissions in the area began last November. Homes were given digital receivers for each of their televisions. A helpline was set up for residents' teething problems, and one-to-one support was made available to the elderly. After three months, the households were asked if they wanted to keep the digital services or revert to analogue only. More than 85% of households responded and 98% voted to retain the digital services. Project director Emyr Byron Hughes said residents had taken to digital because it provided more services. He said: "It is such a leap forward even with the basic digital service, they have just taken to it." Roy Barnes, from Ferryside, has been trying out digital services for the last three months. "You can see more programmes, it's much easier to watch Channel 5 and Channel Four and I like the history programmes," he said. Mr Barnes said that he also listened to the digital radio stations via the television. "It's much clearer, I've thrown my old radio away in the dustbin". The trial had been run to discover how people coped with the new equipment and to see what technical problems might arise in the future. A Department for Culture Media and Sport spokesman said the government had no firm date for when the UK's switchover would begin. The government has said switching to digital would provide a major one-off boost for the UK economy. But the Department of Trade and Industry said on Wednesday it was not clear what the analogue system would be used for, and its future had not yet been determined. Almost 60% of households have already gone digital on at least one television set through cable, satellite or Freeview. But switching could be a problem for the elderly and those on poor incomes and the government is discussing with charities about how to protect the vulnerable. It said a complete switchover would not be authorised until support measures were in place.